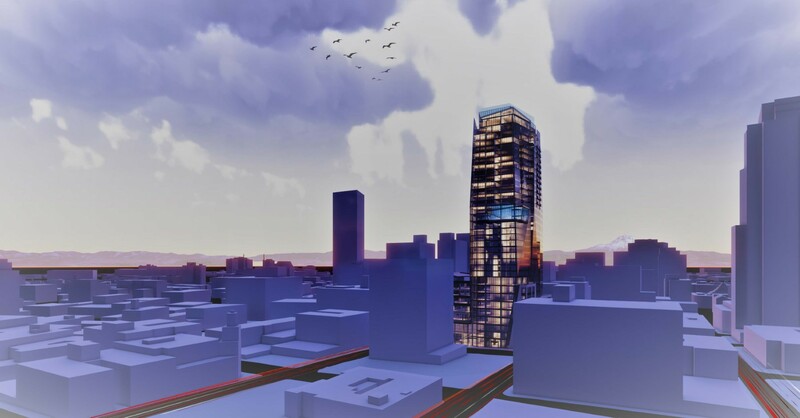 This entry was posted in 5845 NE Hoyt, 6836 NE Grand, Allusa Architecture, Block 216, Con-way Ad-Tech I, GBD Architects, Guerrilla Development, Hyatt Place, Jolene's First Cousin, LRS Architects, Metro Reports, Otak Architects. Bookmark the permalink. Is there any way to see the design review material? I know that you can go to the meeting, but does the city also post any images (plans, renderings, etc) anywhere online? Generally, the week or so before a hearing you can review the applicant’s plans and staff memo. If you go to the design commission page on the BDS website and click on the Design Commission agenda https://www.portlandoregon.gov/bds/42442 you can find the project you’re interested in and a link to the project digital folder in efiles. Mark my word that skyscraper won’t be built or if it does it’ll be much shorter..
Are you just pasting the same comment everytime a tower is mentioned? So childish and pouty. It is like a dare to the developers. I’m really excited about Jolene’s First Cousin. I for one welcome it to the neighborhood. Bummer. I had envisioned Jolene’s First Cousin taking the space where Bar and the End of the Universe is/was. Thought that was a good use of space. This is replacing a nice house. Ah, now I see why I thought that. Same developers are rejiggering the Pub At The End of the Universe as well.